How is it possible to look at the earliest moments of the universe? Physicists have their ways—and what they find out will tell us a lot about how the universe works today and how it will unfold in the future. You may have heard that, when you’re looking at a star at night, you’re actually looking at light emitted up to tens of millions of years ago. It took the light that long to travel from its birthplace to Earth. Evidence of our distant past is everywhere. You just have to know where and how to look for it. One of the great missions of particle physics is to trace this evidence back to our beginnings. “The more we understand our origins, the more we understand ourselves and our place in the cosmos,” says theorist Michael Ramsey-Musolf, director of the Amherst Center for Fundamental Interactions at the University of Massachusetts. 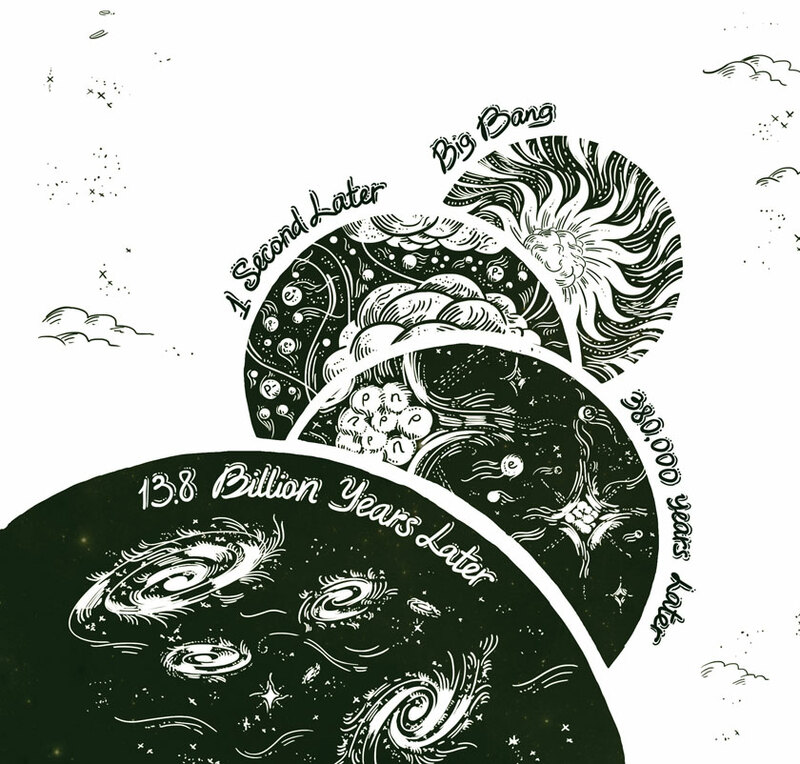 Scientists have used experiments and observations to investigate our past as far back as a second after the big bang. At that point, the starstuff that makes up everything around us began to materialize. But what happened before that decided the character of the universe today—and may even foretell how it someday will end. Particle physicists are working to find out exactly what happened in that very first second. Immediately after the big bang, the universe was a hot, dense soup of particles, including Higgs bosons, quarks and what we now refer to as dark matter. It began to expand and cool. As this happened, the Higgs field as we know it went into effect and gave elementary particles mass. Quarks and gluons began clumping together to form protons and neutrons, which then began to form nuclei. Although we can’t go back in time and study the early universe in person, scientists have been able to look back pretty far, almost to that first second. Astrophysicists can take us part of the way there: back more than 13 billion years to the time 380,000 years after the big bang. They use powerful telescopes to study the cosmic microwave background, a pattern of ancient thermal light that was stamped on the sky when neutral atoms began to form out of the dense particle soup of the early universe. Particle physicists have peered even further into the past using other methods. Experiments at colliders, for example, have already given us limited insight into times before the cosmic microwave background formed, all the way back to that first second after the big bang. Collider experiments can tell us about the first moments because, even though conditions were different just after the big bang, the laws of physics were the same. The laws we see at work today just have different effects at different energy scales. The Relativistic Heavy Ion Collider at Brookhaven National Laboratory in New York and the Large Hadron Collider at CERN in Europe both collide particles at spectacular energies. Although these energies are not—and, by a wide margin, never will be—high enough to recreate the big bang itself, they do mimic some aspects of the early universe, which can tell us something about what it was like. Experiments at both of these colliders, for example, have given scientists evidence that quarks—which are usually tightly bound together—come loose in the right conditions. If quarks come unbound at high energies, they also were unbound in the high-energy environment of our universe just after its birth. Physicists have also gotten clues about the early universe from experiments that examine massive particles produced in particle accelerators. They have found that certain types of particles decay—or transfer their energy into lighter particles—into matter more often than their antiparticles decay into antimatter. This violation of the symmetry of matter and antimatter is a clue to what happened in the early universe, at which point the two should have been equal. 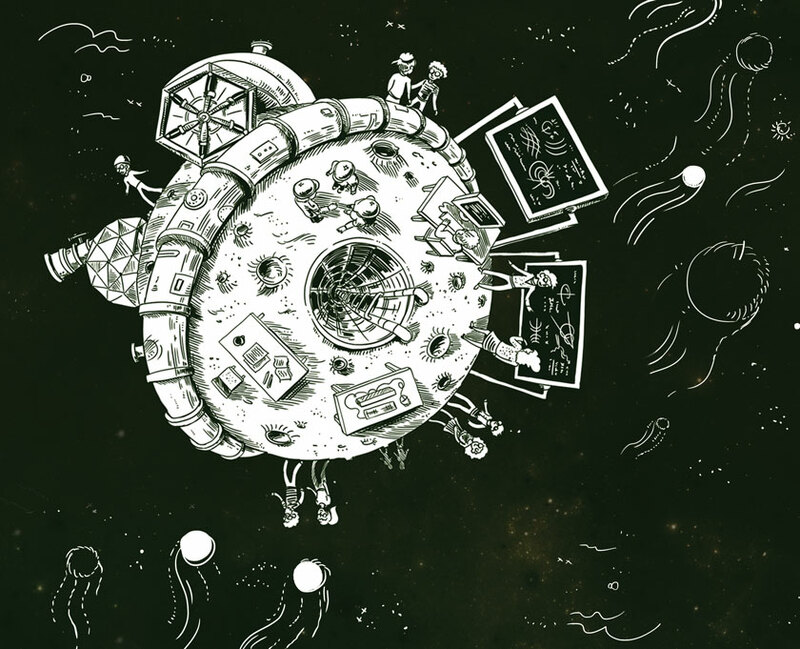 Physicists have learned a lot about the moments after the big bang so far, but they need to work together if they want to find out what happened during that very first second, says theorist Mu-Chun Chen of the University of California, Irvine. Knowing what happened in the first second could answer a couple of major questions: Are all of the known forces that govern interactions between particles of matter actually aspects of a single force? And what happened to all of the antimatter that should have been around just after the big bang? That first question could give us a new understanding of how the world works. Past experiments have led scientists to hypothesize that the laws of physics, as we observe them today, might actually be simpler than they appear. This idea has been building for some time. Isaac Newton simplified our understanding of nature by figuring out that the force that causes apples to fall is the same force that keeps our planet in orbit around the sun. Hans Christian Ørsted did the same when he noticed that an electrical current could push the needle in his compass around, leading to the discovery that electricity and magnetism are two aspects of a single force. 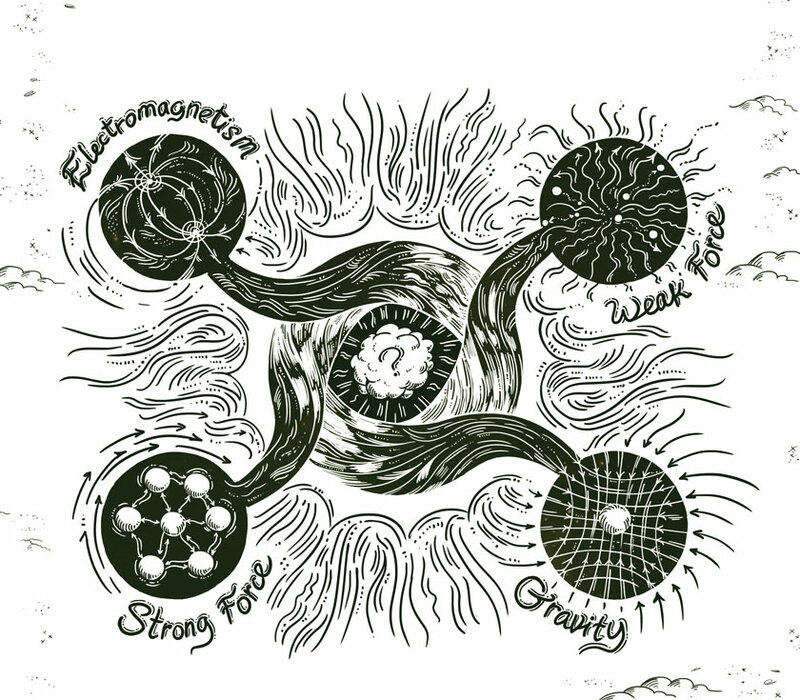 Now we consider electromagnetism to be one of four fundamental forces—the others being the strong nuclear force, which binds together the smallest pieces of atoms; the weak nuclear force, which allows the sun to shine; and gravity. Yet it’s possible that some or all of those began as a single unified force—one that broke apart in the first fraction of a microsecond after the big bang. When scientists extrapolate what they know about the strength of the different forces at different energies, they find a point—at an energy characteristic of the universe less than a trillionth of a trillionth of a trillionth of a second after the big bang—at which all of the forces aside from gravity are equal. “It’s hard to think that’s just a coincidence,” Chen says. String theory, a theory that considers all point-like particles as one-dimensional strings, could provide a way to incorporate gravity into this single force as well. Understanding how the forces relate to one another could give us a more complete picture of the way things work today and where they will head in the future. The second burning question scientists have about the first second is: What happened to all of the antimatter? From everything we’ve been able to see or extrapolate about the laws of nature, the big bang should have created equal amounts of matter and antimatter particles. But when matter and antimatter meet, they annihilate. In a 50-50 universe, no structure should have been able to develop. The matter and antimatter should have cancelled one another out, leaving nothing but pure energy behind. But somehow, matter survived. And the antimatter is almost nowhere to be seen. If the unified force broke apart and matter overcame anti-matter in the first second, physicists want to know about it. One way to investigate the conditions of the early universe is to find out what it was made of. All of the energy that exists today was created in the big bang; that hasn’t changed. What has changed is what kinds of particles we see. The way to make a particle is to convert energy into mass. And the more massive a particle is, the more energy it takes to make. When the universe was much smaller and all its energy was concentrated, it could make much more massive particles than the ones we see today. In fact, our current visible universe consists of only the lightest representatives of three generations of particles. Knowing this, it might seem hopeless that we could understand what the universe was like in the first second. But here’s the surprise: All of those heavier particles still exist, hidden in a virtual layer underneath everything we see—like radio programs broadcast at frequencies our radios cannot receive. Physicists now understand that every particle is actually a ripple of energy in a field. A proton is a ripple in a proton field; an electron is a ripple in an electron field; and so on. Massive particles that existed in the early universe might not all be around today, but their fields—and therefore the potential for those particles to appear—are. We are surrounded by the fields of all the particles that have ever existed. Scientists have already discovered several types of massive particles, but theories about a unified force and the asymmetry of matter and antimatter predict the existence of even more. Some predict the existence of massive versions of neutrinos, which might have tipped off the matter–antimatter imbalance. Others predict a partner particle for every particle we already know. Physicists can search for massive particles in a couple of ways. First, they use accelerators to produce enough energy to pop them out of hiding. This is how particle physics research works at particle accelerators like the Large Hadron Collider. When high-energy particles collide, their energy can convert briefly into mass, sometimes in the form of these particles. But this endeavor is limited by the amount of energy a particle accelerator can generate. A second way to investigate hidden massive particles is to look for them indirectly. These ancient particles can materialize briefly outside of particle collisions using energy borrowed from other particles. When they do this, they can affect how those particles decay or interact with other particles. They can cause mesons—particles made up of quarks—to decay into certain pairs of particles more or less often than expected. They can cause neutrinos to behave in unexpected ways or help particles to convert into other particles. They can affect how neutrons act in an electric field. They can give muons an extra wobble that becomes visible in a magnetic field. Scientists produce large numbers of these particles in accelerators in order to watch for these effects. By carefully measuring a certain type of decay or interaction, scientists can find signs of interference from a hidden particle. Some theories make a particularly intriguing prediction: that protons, building blocks at the heart of every atom, eventually will decay. Not to worry; this catastrophic process would take at least a billion trillion trillion years to destroy our atoms. However, that doesn’t mean scientists will need to wait so long to catch one decaying. Measuring a particle’s half-life is all about probability. For instance, if you have 10 atoms with a half-life of 24 hours, you’ll likely be down to five atoms at the end of the day. But the five atoms you lost would not have decayed all at once. One might have decayed after just a second, and another after 23 hours. So it is with protons. A few might be decaying as you read this, but we just don’t have the tools yet to observe it. Current and planned experiments will examine more than a billion trillion trillion protons in detectors deep underground to attempt to catch the extremely rare decay of this particle with a half-life of at least 1034 years—that’s the number 1 with 34 zeros after it. Discovering proton decay would be a strong sign that theories about the unification of forces and the asymmetry of matter and antimatter are correct. Physicists could also find insight into the first second in patterns other than the cosmic microwave background left in the sky. Before the cosmic microwave background formed, the universe appeared cloudy because it was filled with charged particles. Light was trapped inside that cosmic soup; if it traveled even a short distance, it would bounce off a charged particle. Eventually, the universe cooled and became transparent as particles combined to form neutral atoms. The escaping light is now what we call the cosmic microwave background. Scientists using light-based methods have not been able to see back beyond that point. But one particle, the neutrino, is wily enough that it should have been able to sneak through that haze. Because neutrinos interact so rarely with other matter, they would not have been absorbed by other particles in the dense, pre-cosmic microwave background universe. If physicists could study patterns in neutrinos from the early universe, they could look even further back in time. Scientists are looking for ways to do this, but they have not yet succeeded. Physicists also hope to find patterns left behind from the early days in gravitational waves. Like the cosmic microwave background, gravitational waves—theoretical ripples in spacetime created as a massive object moves—should offer a map of what the universe looked like in earlier times. Because these waves wouldn’t have been affected by the early universe’s cloudiness, this map would offer a glimpse into the very first moments—as early as 10-36 seconds after the big bang. (That’s a trillionth of a trillionth of a trillionth of a second.) Researchers have built ultra-sensitive detectors to look for gravitational waves, but they have not found them yet. Solving the mystery of what happened in the first second of the universe requires the work of both theorists and experimentalists. Theorists invent models and determine their predictions; experimentalists come up with ways to test these predictions; and together, theorists and experimentalists analyze the results. In the coming years, scientists will use particle accelerators and precise measurements to search for massive particles predicted in theories about the first second after the big bang. They will use extremely sensitive detectors to learn more about neutrinos, potentially revealing the particle’s more massive, still hidden cousins that contributed to the imbalance between matter and antimatter. They will hunt for patterns similar to the cosmic microwave background that neutrinos or gravitational waves might have left in the expansion of the early universe. And they will look for phenomena predicted in their theories such as proton decay. In the end, it’s not just about looking to where we came from. Answering questions about our origins gives us a more complete picture of how the universe works and helps us understand where it’s headed in the future. Broaden and deepen your understanding of particle physics and astrophysics. Particle physicists and astrophysicists employ a variety of tools to avoid erroneous results. The pursuit of dark matter and dark energy is one of the most exciting—and most challenging—areas of science. For years, scientists thought that neutrinos fit perfectly into the Standard Model. But they don't. Supersymmetry is a proposed property of the universe. Supersymmetry requires every type of particle to have an associated supersymmetric particle, called its superpartner. Cosmic microwave background is the oldest light in the universe. CP is violated if there is a difference between the ways nature treats matter and antimatter. A new observation by the LHCb experiment finds that charm quarks behave differently than their antiparticle counterparts.